The Twitterfox and Facebook Firefox plugins work well enough but I'd like a more unified interface. Twitterfox can only show a limited number of updates after not checking updates for a day. I tried the Adobe Air applications, including Twhirl and Tweetdeck . These are both great dedicated Twitter clients. The multipane approach of Tweetdeck and ability to group those you follow into panes is powerful. Both provide Growl-like notification panes. My biggest beefs with these clients are their inability to up font size and Air application's use of the system's default HTML editor to view posted URLs rather than the system's default browser. When I click on posted links, they open in Textmate rather than Firefox. AlertThingy is another Adobe Air client with a multipane UI similar to Tweetdeck. AlertThingy is a bit more appealing because in addition to Twitter updates, it can also display your Facebook, Flickr, and updates from several other services. Currently, however, AlertThingy doesn't clearly show read vs. unread items and it doesn't seem to reliably retain changes in settings from session to session. I finally decided to purchase EventBox after giving it a try. 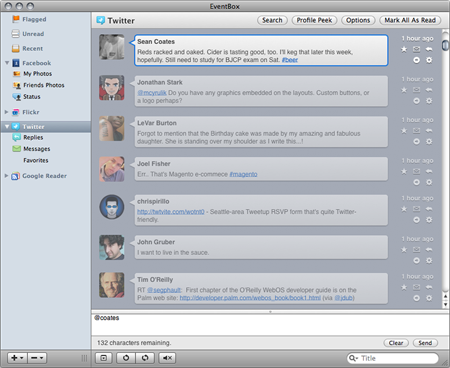 EventBox is an OS X-only client that supports display of Facebook, Twitter, Flickr, and Reddit status, comment, and photo updates. It also includes a generic RSS reader plus support for Google Reader. All of this plus the promise of additional service support convinced me to shell out $15 for a license. EventBox isn't perfect, but it provides more of what I'm looking for with many of the benefits that come with an OS X native application. The interface is clean and intuitive and provides service-specific views as well as an aggregated unread and recent item views. Unread updates are faded and appear clearly different from unread items. I can control update intervals for each service and turn off new item alerts when I need to tune out distractions and get things done. 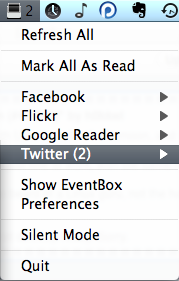 EventBox also provides an Apple Menu item with an unread count and a summary list of recent updates. Photo viewing for Facebook and Flickr is nice and you can even upload images and edit image metadata directly in EventBox. EventBox doesn't provide font size controls but overall, this is the only real issue I have with it. 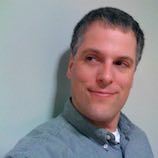 I hope that they add support for Ping.fm, LinkedIn, and Delicious. I also hope that thet add support for the Newsgator feed reader, although I might decide to switch to Google Reader. Sync of unread items between multiple installs would be nice to have too. Oh, and they'd really create a stir with an iPhone app! I'm looking forward to seeing where The Cosmic Machine takes EventBox next. Download the free two week trial and see what you think.